Admiral Kelly, Captain Card, officers and sailors of the USS Abraham Lincoln, my fellow Americans: Major combat operations in Iraq have ended. 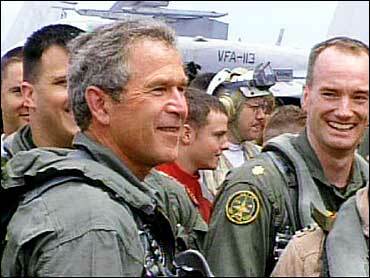 In the Battle of Iraq, the United States and our allies have prevailed. And now our coalition is engaged in securing and reconstructing that country. In this battle, we have fought for the cause of liberty, and for the peace of the world. Our nation and our coalition are proud of this accomplishment — yet it is you, the members of the United States military, who achieved it. Your courage — your willingness to face danger for your country and for each other — made this day possible. Because of you, our nation is more secure. Because of you, the tyrant has fallen, and Iraq is free. Operation Iraqi Freedom was carried out with a combination of precision, and speed, and boldness the enemy did not expect, and the world had not seen before. From distant bases or ships at sea, we sent planes and missiles that could destroy an enemy division, or strike a single bunker. Marines and soldiers charged to Baghdad across 350 miles of hostile ground, in one of the swiftest advances of heavy arms in history. You have shown the world the skill and the might of the American Armed Forces. This nation thanks all of the members of our coalition who joined in a noble cause. We thank the Armed Forces of the United Kingdom, Australia, and Poland, who shared in the hardships of war. We thank all of the citizens of Iraq who welcomed our troops and joined in the liberation of their own country. And tonight, I have a special word for Secretary (Donald) Rumsfeld, for General (Tommy) Franks, and for all the men and women who wear the uniform of the United States: America is grateful for a job well done. The character of our military through history — the daring of Normandy, the fierce courage of Iwo Jima, the decency and idealism that turned enemies into allies — is fully present in this generation. When Iraqi civilians looked into the faces of our servicemen and women, they saw strength, and kindness, and good will. When I look at the members of the United States military, I see the best of our country, and I am honored to be your commander in chief. In the images of fallen statues, we have witnessed the arrival of a new era. For a hundred years of war, culminating in the nuclear age, military technology was designed and deployed to inflict casualties on an ever-growing scale. In defeating Nazi Germany and imperial Japan, Allied Forces destroyed entire cities, while enemy leaders who started the conflict were safe until the final days. Military power was used to end a regime by breaking a nation. Today, we have the greater power to free a nation by breaking a dangerous and aggressive regime. With new tactics and precision weapons, we can achieve military objectives without directing violence against civilians. No device of man can remove the tragedy from war. Yet it is a great advance when the guilty have far more to fear from war than the innocent. In the images of celebrating Iraqis, we have also seen the ageless appeal of human freedom. Decades of lies and intimidation could not make the Iraqi people love their oppressors or desire their own enslavement. Men and women in every culture need liberty like they need food, and water, and air. Everywhere that freedom arrives, humanity rejoices. And everywhere that freedom stirs, let tyrants fear. We have difficult work to do in Iraq. We are bringing order to parts of that country that remain dangerous. We are pursuing and finding leaders of the old regime, who will be held to account for their crimes. We have begun the search for hidden chemical and biological weapons, and already know of hundreds of sites that will be investigated. We are helping to rebuild Iraq, where the dictator built palaces for himself, instead of hospitals and schools. And we will stand with the new leaders of Iraq as they establish a government of, by, and for the Iraqi people. The transition from dictatorship to democracy will take time, but it is worth every effort. Our coalition will stay until our work is done. And then we will leave — and we will leave behind a free Iraq. The Battle of Iraq is one victory in a war on terror that began on September the 11th, 2001, and still goes on. That terrible morning, 19 evil men — the shock troops of a hateful ideology — gave America and the civilized world a glimpse of their ambitions. They imagined, in the words of one terrorist, that September the 11th would be the "beginning of the end of America." By seeking to turn our cities into killing fields, terrorists and their allies believed that they could destroy this nation's resolve, and force our retreat from the world. They have failed. In the Battle of Afghanistan, we destroyed the Taliban, many terrorists, and the camps where they trained. We continue to help the Afghan people lay roads, restore hospitals, and educate all of their children. Yet we also have dangerous work to complete. As I speak, a special operations task force, led by the 82nd Airborne, is on the trail of the terrorists, and those who seek to undermine the free government of Afghanistan. America and our coalition will finish what we have begun. From Pakistan to the Philippines to the Horn of Africa, we are hunting down al-Qaida killers. Nineteen months ago, I pledged that the terrorists would not escape the patient justice of the United States. And as of tonight, nearly one-half of al-Qaida's senior operatives have been captured or killed. The liberation of Iraq is a crucial advance in the campaign against terror. We have removed an ally of al-Qaida, and cut off a source of terrorist funding. And this much is certain: No terrorist network will gain weapons of mass destruction from the Iraqi regime, because the regime is no more. In these 19 months that changed the world, our actions have been focused, and deliberate, and proportionate to the offense. We have not forgotten the victims of September the 11th — the last phone calls, the cold murder of children, the searches in the rubble. With those attacks, the terrorists and their supporters declared war on the United States. And war is what they got. Any person involved in committing or planning terrorist attacks against the American people becomes an enemy of this country, and a target of American justice. Any person, organization, or government that supports, protects, or harbors terrorists is complicit in the murder of the innocent, and equally guilty of terrorist crimes. Any outlaw regime that has ties to terrorist groups, and seeks or possesses weapons of mass destruction, is a grave danger to the civilized world, and will be confronted. And anyone in the world, including the Arab world, who works and sacrifices for freedom has a loyal friend in the United States of America. Our commitment to liberty is America's tradition — declared at our founding, affirmed in Franklin Roosevelt's Four Freedoms, asserted in the Truman Doctrine, and in Ronald Reagan's challenge to an evil empire. We are committed to freedom in Afghanistan, in Iraq, and in a peaceful Palestine. The advance of freedom is the surest strategy to undermine the appeal of terror in the world. Where freedom takes hold, hatred gives way to hope. When freedom takes hold, men and women turn to the peaceful pursuit of a better life. American values, and American interests, lead in the same direction: We stand for human liberty. The United States upholds these principles of security and freedom in many ways — with all the tools of diplomacy, law enforcement, intelligence, and finance. We are working with a broad coalition of nations that understand the threat, and our shared responsibility to meet it. The use of force has been, and remains, our last resort. Yet all can know, friend and foe alike, that our nation has a mission: We will answer threats to our security, and we will defend the peace. Our mission continues. Al-Qaida is wounded, not destroyed. The scattered cells of the terrorist network still operate in many nations, and we know from daily intelligence that they continue to plot against free people. The proliferation of deadly weapons remains a serious danger. The enemies of freedom are not idle, and neither are we. Our government has taken unprecedented measures to defend the homeland — and we will continue to hunt down the enemy before he can strike. The war on terror is not over, yet it is not endless. We do not know the day of final victory, but we have seen the turning of the tide. No act of the terrorists will change our purpose, or weaken our resolve, or alter their fate. Their cause is lost. Free nations will press on to victory. Other nations in history have fought in foreign lands and remained to occupy and exploit. Americans, following a battle, want nothing more than to return home. And that is your direction tonight. After service in the Afghan and Iraqi theaters of war — after 100,000 miles, on the longest carrier deployment in recent history — you are homeward bound. Some of you will see new family members for the first time — 150 babies were born while their fathers were on the Lincoln. Your families are proud of you, and your nation will welcome you. We are mindful as well that some good men and women are not making the journey home. One of those who fell, Corporal Jason Mileo, spoke to his parents five days before his death. Jason's father said, "He called us from the center of Baghdad, not to brag, but to tell us he loved us. Our son was a soldier." Every name, every life, is a loss to our military, to our nation, and to the loved ones who grieve. There is no homecoming for these families. Yet we pray, in God's time, their reunion will come. Thank you for serving our country and our cause. May God bless you all, and may God continue to bless America.